Response rates from direct mail are more than 20X that of email per 2015 DMA Response Rate Report. 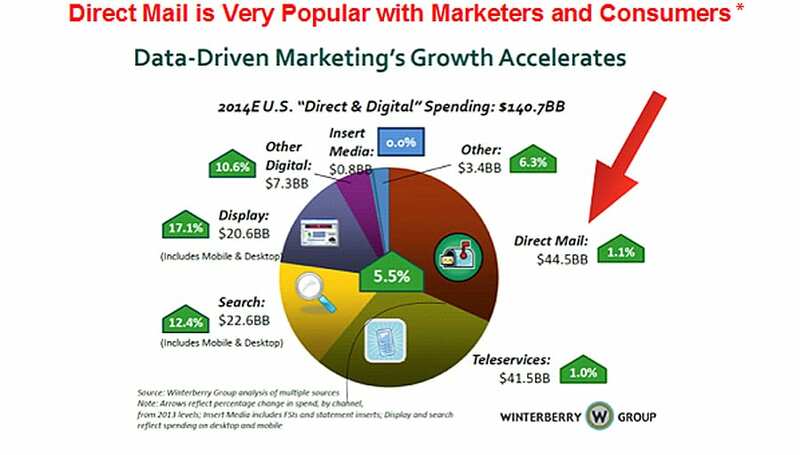 The channel that gives the strongest ROI for customer acquisition and retention is direct mail per Target Marketing Magazine 2013 Media Study. Physical media such as print and direct mail leaves a stronger impression on the brain than virtual media per Millward Brown Global Research Study. If your sales depend on affluent consumers, direct mail can reach your target market more cost efficiently and effectively than any other channel. And it makes a much better first impression than email. We can develop for you, on a custom basis, a highly targeted and uniquely accurate mailing list of people with the same profile as your best customers. To learn more about how we can help you, click here to see how we develop on a custom basis mailing lists that meet the individual specifications of each of our clients and how we differ from other list vendors. 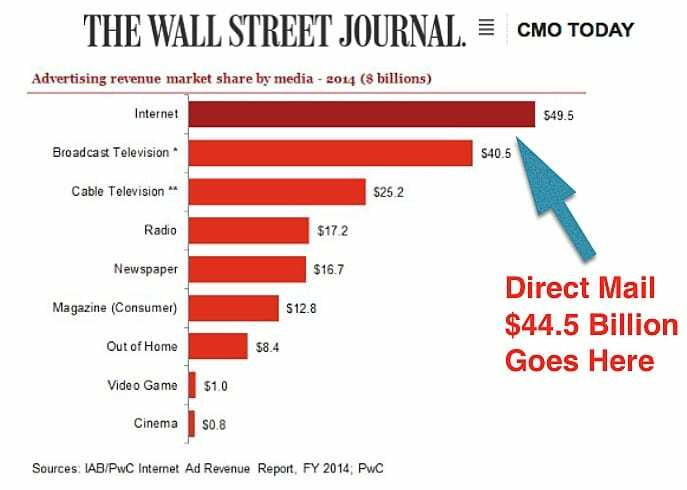 As shown in the WSJ chart below, direct mail was second (only slightly) to the spending on internet advertising. Marketers would not spend this amount of money ($44.5 billion) on an activity that did not produce for them. Our thanks to Modern Postcard for bringing the three research studies to our attention and to Target Marketing magazine for the infographics.